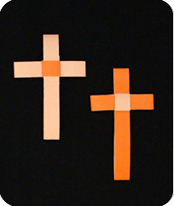 This paper Easter Cross is quite easy to make. Once you’ve figured it out, you will find yourself making many of them. You can use them for scrap-booking or for birth announcements; you can give them as keepsakes or use them as bookmarks. You can use paper that is the same color on both sides, or you can use paper that is a different color on the front and back side. 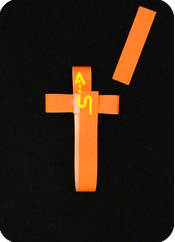 In the second case, the arms of the cross will be a different color compared to the center of the cross. The paper should be a long strip of paper of ratio 1:30 or longer. This means that if it is 1 inch wide, it will need to be 30 inches long. Most people don’t have paper of this length. A more accessible size would be to take an 8.5″ x 11″ sheet of paper and cut off a strip that is 3/8 inch wide and 11 inches long. 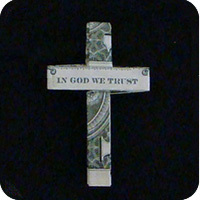 This makes a cross that is approx. 2.5 inches high. 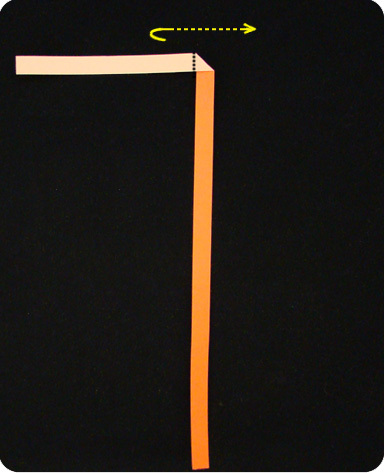 Start with a long strip of paper that is of ratio 1 wide :30 long. Make a 45 degree angle fold so the top 1/3 of the paper is folded to the left. 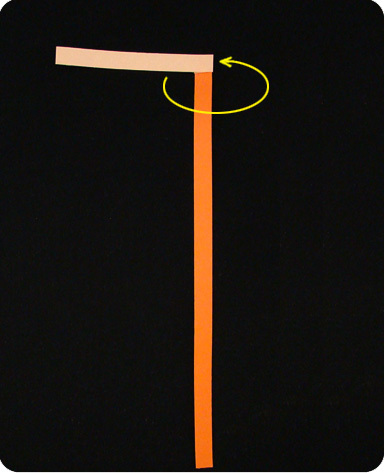 In this example, the paper was 3/8″ x 12″ and it is duo color. 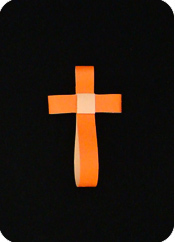 The orange-side is facing up so the final cross will be mostly orange in color. Mountain fold (fold behind) so the top 1/3 of the paper points towards the right. 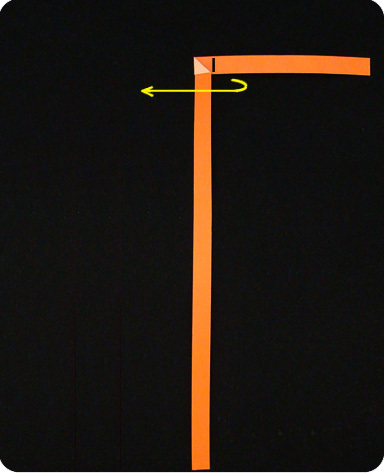 Make a valley fold so the top part of the paper points towards the left. When making these folds, make sure the folds are straight because you will need to weave the paper through these layers of paper. If the folds are not straight, you will have trouble weaving the paper through. Bring the paper in front and towards the left: form a loop. Adjust the loop evenly so there is the same amount of paper on the left and the right. Press down at the center. Holding the layers in place, make a valley fold so the paper flips down. 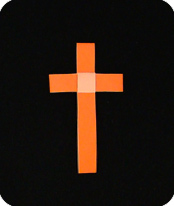 The white part of the paper at the center of the cross will be visible. 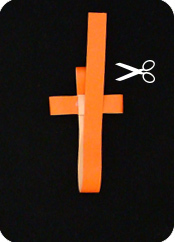 Bring up the bottom end of the paper and weave it under the white-square at the center of the cross. Pull through completely. Once this is done, the model is quite stable and will not unravel. Bring this end of the paper back down and weave it through the central square. Note how the orange side of the paper is visible. Pull through but not completely. Keep a loop at the top of the model. This loop should be a little longer than the left and right arms of the cross. Bring the end of the paper up. Approximate how much paper you need to make a proportional cross. If necessary, cut excess paper. Tuck the tail end of the paper under the central square. Make any last minute adjustments and then flatten the model. If you start with the white-side of the paper facing up then the cross will be predominantly white with a central colored patch.